Thank you for continuing to be a major comfort four months and three weeks after my daughter was born. Even though I can now squeeze my ‘new’ body and it’s +7 lbs into a pair of my pre-pregnancy jeans, I choose to wear you. You provide extra warmth across my belly in the winter, don’t give me a muffin top, and never scoff at me for eating things as delicious as cornbread with salted & browned honey butter. 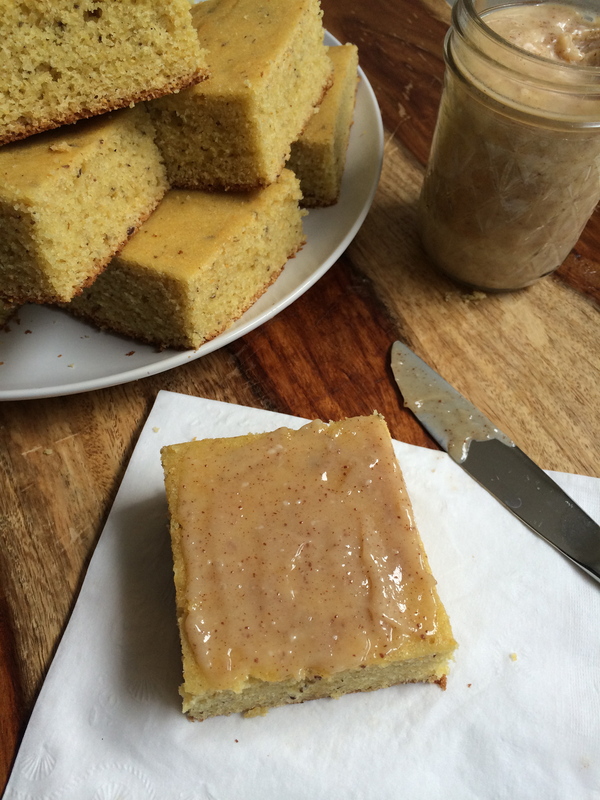 This cornbread is good, but the salted and browned honey butter is outstanding. I could forego the cornbread and eat the butter solo. When diving into the jar I have to continually remind myself that it is butter so as to not eat it in its entirety. Basically, what I’m saying is make this. Make this now. If you don’t have the ingredients for corn bread, screw it and just make the butter. (Unless you are vegan, I know you have butter in your fridge.) Put it on anything and everything: a slice of toast, a piece of chicken, a morning muffin, pancakes, a cinnamon raisin bagel, a ham panini with gruyere and thyme. The list is never ending. Pre-heat oven to 350. Line an 8×8 or 9×9 pan with parchment and grease with butter. Melt the butter in a large microwave safe bowl on medium until fully melted. Wisk in sugar and eggs (or flax concoction). Wisk in buttermilk. Wisk in baking soda. Wisk in cornmeal, flour, and salt. Batter will still be lumpy and this is fine. Pour batter into pan and bake for 30-35 minutes or until toothpick inserted in the center comes out clean. In a small saucepan, melt one stick of butter over medium heat. Once melted, reduce heat to medium-low. The butter will melt, then foam. The foam will stay, but underneath, the butter will first turn clear golden and then start to turn brown and smell nutty. Stir frequently with a silicon spatula, scraping up any bits from the bottom as you do. Remove from heat and cool to room temperature. While it is cooling, leave the other half of the butter out to soften slightly (semi-firm is fine). Whip softened butter with an electric mixer until fluffy. Slowly drizzle in the room temperature browned butter, honey and salt continue whipping until thoroughly combined. Chill butter in fridge until a nice spreadable consistency, or until needed.